The EEU is an opportunity for Europe to engage with Eurasia — and mend ties with Russia. The escalation of the Ukrainian crisis casts the Eurasian Economic Union countries in a completely new light. Contrary to common expectations, the former Soviet republics of Belarus and Kazakhstan demonstrated their determination to preserve neutrality amid exacerbating tensions between Moscow and Kiev. Balancing the competing interests of Russia, China, and the U.S. in the Kremlin’s “near abroad” has been essential for upholding the Central Asian states’ multi-vector foreign policy. One should not forget that the idea of a Eurasian alliance introduced by Kazakh President Nursultan Nazarbayev in 1994 referred first and foremost to an economic grouping meant to strengthen the already existing trade relations and to boost productivity and economic growth. (The political and security dimension of the project were never brought into play.) One might thus be inclined to think that, with Russia becoming less appealing as a partner due to falling oil prices, its collapsing currency, and tightening economic sanctions, Central Asian states might want to rethink their priorities and come to question their participation in the Eurasian Economic Union. This would be a rather ill-considered conclusion, as it does not take into account the long history of coexistence, cooperation, and solidarity between Russia and its former Soviet Socialist republics. To understand the complex dynamics underlying this multi-faceted relationship, one must go beyond simple cost-benefit analyses and tap into a comprehensive constructivist approach, exploring cultural, social, and linguistic factors. Underlining the importance of deepening cooperation with Russia despite current challenges, the thought-provoking statement by former Prime Minister of Kyrgyzstan Djoomart Otorbaev illustrates the depth of this relationship: “We are not selecting our partners based on crude oil prices or, as a matter of fact, any other economic turbulence that might occur.” Such a bond, sealed with collective memories of a shared past, cannot be easily overshadowed by what are being seen as temporary financial difficulties. At the same time, the position of the EEU member states does not lack pragmatism either. The EEU countries inherited from the USSR a set of interconnected and mutually reinforcing infrastructure facilities – road, rail, and energy networks – which, even if partly outdated, may be considered a competitive advantage for any integration initiative in the region. With energy being the conventional cornerstone of Russia’s economic partnerships, what the EEU offers is the opportunity of creating a common electricity market by 2019 as well as common oil and gas markets by 2025. The establishment of the electricity market seems quite realistic, as it will be able to build on the old Soviet grid system and will essentially create economies of scale. Furthermore, Russia has long been a major destination for labor migrants from Commonwealth of Independent States (CIS) countries. Not only has exporting their workforce helped alleviate unemployment and ease social tensions within the source countries, but migrant remittances from Russia have largely contributed to these countries’ GDP. In this regard, the accession of Central Asian states to the EEU, which ensures the free flow of labor, implies increasing employment opportunities and improved working conditions for their nationals. 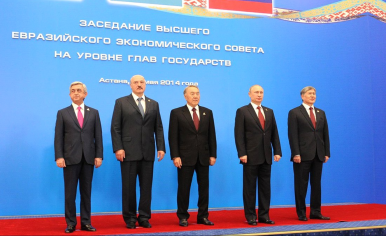 The EEU: An Opening for Europe-Russia Rapprochement? Ignoring the regional dynamics and betting on the institutional failure of the new EEU cannot be in Europe’s long-term interest. Especially with Russia slipping more and more into the role of China’s elder sister (whom you respect but whose advice you are not obliged to follow) or losing even more authority, Western states could approach Moscow by offering a way back into an international community of states sharing burden and responsibility. One possible scenario would be to explore opportunities for cooperation between the EU and the EEU and to initiate talks for identifying a shared legal and institutional framework based on a jointly developed set of rules. Any negotiations of this kind should be inclusive and transparent. Despite Russia’s and China’s competing interests over the Central Asian states that are part of China’s One Belt, One Road initiative (with its vague rhetoric of “win-win cooperation”) and the Eurasian Economic Union (which, on the contrary, has already elaborated a set of complex regulations), the parties have managed to agree preliminarily to coordinate the development of the two projects. The Kremlin has realized that it can maintain its influence and confront the rising economic ambitions of China in Central Asia only through involvement and close coordination. That is the opportunity (with regard to both China and Russia) that Brussels is currently missing out on in the region. As Otorbaev also pointed out, harmonizing different models of regional economic integration and engaging openly with all relevant stakeholders would increasingly benefit the landlocked Central Asian states by substantially enhancing connectivity, improving transit corridor and transportation infrastructure, and unlocking new investment opportunities. Turning their geographical position into a strategic advantage would necessarily improve their negotiating leverage and could also make their foreign policies more proactive. This would then allow Europe to concentrate on strategic areas of convergence such as energy diversification and regional security. Beyond optimizing trade routes and boosting economic growth in Europe’s eastern neighborhood, potential cooperation between the EU and the EEU could also lay the foundation for cross-regional energy cooperation, expanding the international energy security dialogue and improving energy supply administration by bringing together decision-makers from consumer, producer, and transit countries. Furthermore, in view of interlinked security threats such as cross-border conflicts, failing statehood spillover, and the spread of Islamic State jihadist propaganda and attacks, developing a joint counterterrorism strategy engaging stakeholders from Europe, Russia, China, and the Central Asian region is indispensable for the long-term stabilization and security of politically fragile transit regions and contested resource-rich territories and is in the interest of all countries. In this regard, the collaboration between the EU and the Shanghai Cooperation Organization fighting the three evils of terrorism, separatism, and extremism in the region is long overdue. The romantic dream of Greater Europe has been shattered. The Eurasian Century might have begun, and while Russia has asserted itself as a Eurasian power, Europe’s role in the future order remains to be defined. Instead of further encouraging political fragmentation, European decision-makers should finally start building truly sustainable bridges rather than relying upon short-lived transportation rafts. This means drawing on existing strategic interests and translating them into mutually beneficial trade, investment, and security policies, especially in the field of energy cooperation and counterterrorism. Reconciling the interests of major stakeholders – including those of previously neglected corridor states – requires reestablishing trust and dialogue at eye-level, identifying common core values, reaching a shared vision for developing the Eurasian space, and taking steps to make this shared vision a reality. Liudmila Filippova is Program Manager at the Russian International Affairs Council (RIAC), Moscow. Inna Veleva is Project Manager of Global Dialogue at the BMW Foundation, Berlin. China Pushes One Belt, One Road in Central AsiaRussia's 'Pivot to Asia' and the SCOEurope's New Central Asia StrategyAt Russia's Military Parade, Putin and Xi Cement TiesAmerica's AIIB Disaster: Are There Lessons to be Learned?